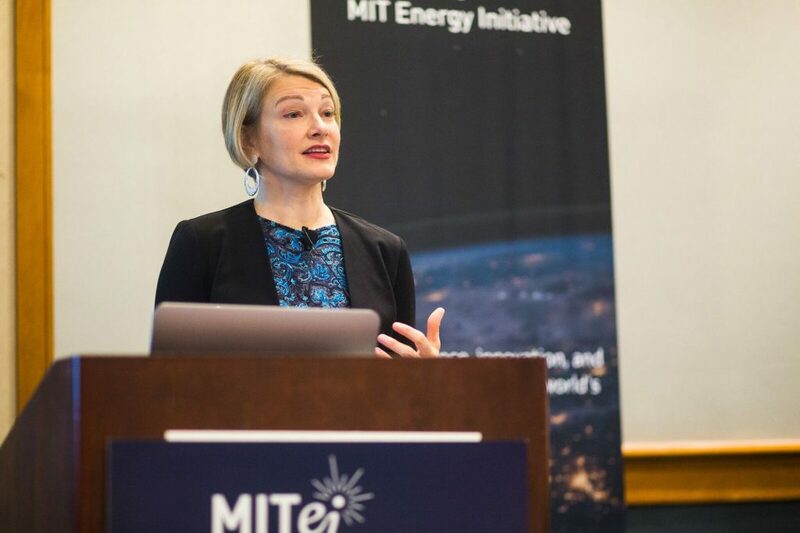 MITEI’s 2018 Annual Research Conference brought together energy researchers, policymakers, and industry members who are working on the cutting-edge technologies and business models for the transition to a low-carbon future. 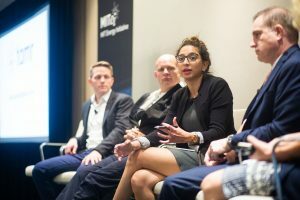 Panels ranged from the latest developments in the fight against climate change to innovations for creating a better environment for energy startups to thrive. A special segment of the conference, presented in collaboration with MIT’s recently launched Quest for Intelligence, focused on the role of artificial intelligence and machine learning in the energy sector. 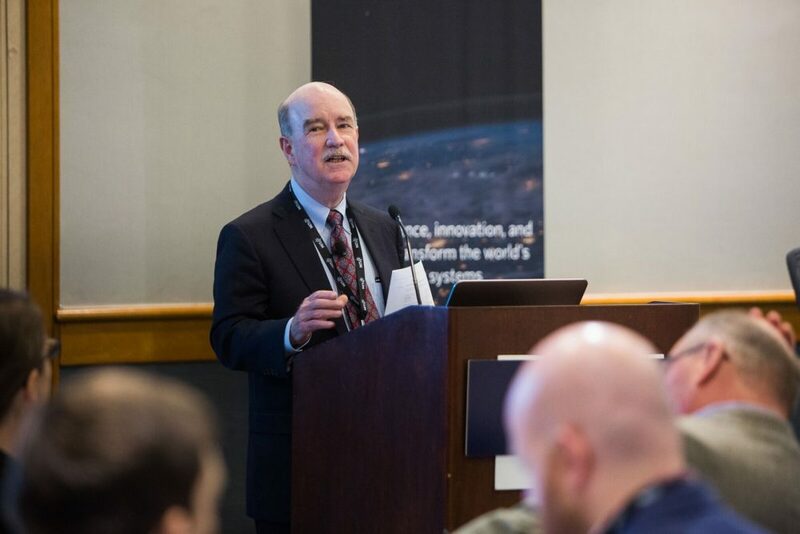 Here, MITEI Director Robert Armstrong discusses highlights from the conference, and visions for the future of energy innovations to meet global energy demand while addressing climate change. Q: Entrepreneurship and energy startups were a big theme of this year’s conference. How is the MIT innovation ecosystem working to make it easier for “tough tech” startups like those in energy, which require more capital and different kinds of resources than typical startups? A: MIT realizes the value of proximity. In Kendall Square and in the Greater Boston area, we have a rich innovation ecosystem, from the Institute itself, paired with industry and federal government support for fundamental and applied research, to the startup incubators right down the street like Greentown Labs. Most recently, MIT started The Engine, which offers a new way to fund and nurture startups in the tough tech area. All of these spaces help startups find their footing and grow. It’s more than just the physical space, too. It’s networking with other startups and sharing of ideas and laboratory facilities. A good example of a startup that needs a different kind of nurturing is Commonwealth Fusion Systems (CFS), a recent MIT spinout that aims to develop affordable, practical fusion power. Fusion is an area in which a startup generally needs a lot more capital than is typical. It’s not an area for typical venture capital investment. MITEI, though, brought CFS in contact with energy companies that had the interest and the resources to engage in this area of the energy transition. Connections like these are an integral part of MITEI’s new startup membership model, which brings the unique needs of energy startups to the forefront. Many of these startups also need access to very specialized equipment, facilities, and infrastructure. The MIT ecosystem, with our specialized lab space that you won’t find in a typical startup garage, can help with that—including the new MIT.nano building, which is being outfitted with cutting-edge equipment that will be available for non-MIT entities to use. At MIT, we also have access to highly talented and skilled human capital, which for tough tech startups, can be substantial: It’s not three people in a garage; it can be 30 people, each with a specific skill set. Q: Some of the conference focused on advances and opportunities in materials design and application. What role does the study and development of new and advanced materials play in the energy space? A: Materials needs in the energy industry are extremely diverse. From nanomaterials to metal alloys, materials are going to play a role in everything from energy production and conversion to transmission, distribution, and end use. The challenges facing the materials industry are broad, though. One example is the issue of materials lifetimes. How do they degrade? Which properties are most affected as they degrade? How can performance lifetimes be extended? The degradation of every material is different, so there’s not going to be one breakthrough that tells you how to stop degradation of every material in your business, wish as you might. The energy space is also rich with instances where there’s a need for the discovery and creation of new materials. With batteries, for example, we need new materials and new chemistries, depending on the application of the battery, that allow you to store energy very cheaply. These materials also need to withstand the cycling of the batteries, the rate of charge and discharge, and allow them to retain performance over many cycles at a price point that makes them affordable for deployment with intermittent renewables like solar or wind. In the nuclear area, as well, we’re working on designing materials that are better at withstanding corrosion, which can guarantee the safety and reliability of nuclear plants for much longer lifetimes. Q: Research discussed at the conference ranged from more efficient 3D printing to the use of carbon nanotube electrodes in water desalination. How do all of these technological advances play into the larger framework of combatting climate change? A: Just before the conference convened, the Intergovernmental Panel on Climate Change (IPCC) special report was released, which shows that when it comes to climate change, adverse impacts are happening faster than we thought. The changes in our world, in storm intensity and sea level rise and so much else, that we thought would come with a 2°C level rise in global temperatures may now happen at 1.5 degrees. With this in mind, we need to lower our estimates for the temperature rise that we think is feasible to live with. That’s different than saying we know how to get there, though. It is challenging to think about 2°C, and it’s even more challenging to think about 1.5°C. A lot of our discussion focused on how we might do that, with tools like negative emissions technologies, paired with a carbon price. Somewhere down the road we will almost certainly find we’ve exceeded 1.5 degrees, so how do we get back to where we need to be? It’s really important to develop a common understanding of what the problem is and what its dimensions are. At this conference, we examined the range of technologies and sectors in the economy that need to be addressed to mitigate climate change. Energy is the big one, but not the only one. Within energy, the electric power system has received the most attention, and we looked in depth at the rapid changes occurring there. We discussed how to not only develop low-carbon energy technology, but also to get it out of the lab and scale it up. Our industrial collaborators are essential here. In addition, the innovation ecosystem centered at MIT, with all of its promising energy startups, can and is playing an increasing role in mitigating greenhouse gas emissions from all parts of the energy sector. The transportation sector also presents significant opportunities, which we’ll be examining in our forthcoming Mobility of the Future report. 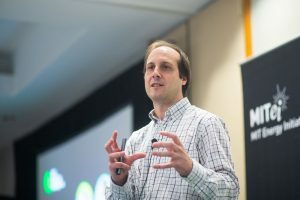 Q: The theme of this year’s Annual Research Conference was “Energy Intelligence.” What role will artificial intelligence play in realizing the low-carbon energy future? A: There are many points of connection and crossover between energy and artificial intelligence. The newly founded Quest for Intelligence at MIT is a very exciting example where MIT is bringing together researchers from multiple disciplines across all of MIT’s five schools. At its core, the Quest is looking at the essence of human and machine intelligence. But it’s also looking to connect this high-level study of intelligence to other disciplines that can benefit from the crossover. One example is intelligence in robotics. Today’s drones are capable of a new level of speed and dexterity which has important implications in the energy industry. Nimble drones could change the way infrastructure surveys are done, and could also be used for monitoring. Monitoring for natural gas leaks, for example, is important in ensuring you recover all possible carbon reduction benefits from coal to gas switching. In the transportation sector, this kind of technology could allow us to create the next generation of energy-efficient autonomous vehicles, for example, designing cars that can drive in close proximity to one another to reduce air drag. MITEI researchers are also tying artificial intelligence into their domain-specific energy research through the use of machine learning. Machine learning can be used to identify patterns of degradation in advanced materials, and can even be used to quickly screen for the best recipes for manufacturing new materials at commercial scale. That kind of innovation is going to grow rapidly in coming years, which will only serve to enrich the research projects coming out of MITEI. Part of the Energy Initiative’s mission is to bring faculty members and researchers together who have complementary skills. As faculty from the Quest begin collaborating with faculty focusing on energy in new ways, they’ll be able to accomplish things together that none of them could do alone, opening up new doors to a low-carbon energy future.